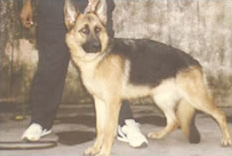 The undisputed king of dogs, the versatile German Shepherd has done more in the service of mankind than any other. Apart from his original sheep herding role, he has excelled as a sentry and guard dog, police and army dog, tracker, drug detection dog, guide dog for the blind, as well as a search and rescue dog. However, above all else, the German Shepherd is a superb companion dog. He is utterly devoted to his owner and family, but has a natural wariness of strangers and should be supervised with visitors and visiting children. It is essential that the German Shepherd feels that he has a job to do in life and he needs regular exercise. His extreme intelligence needs to be utilised in some positive way. either by taking him to obedience training or by keeping him busily involved in family activities and outings and he should be socialised from an early age.